The latest state-of-the-industry report examining the health and welfare of cattle in Great Britain has identified significant progress across key areas of mastitis, lameness and longevity, and for the first time looks in depth at the issues facing the dairy and beef sectors around antimicrobial resistance (AMR). 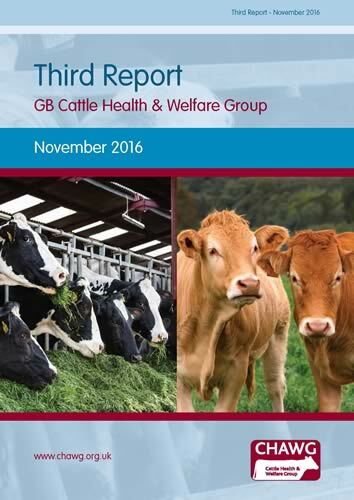 This third biennial offering from GB’s Cattle Health and Welfare Group also contains a summary of progress on endemic disease control with advances in eradicating Bovine Viral Diarrhoea (BVD) in each country particularly highlighted. The Chief Veterinary Officers of UK, Scotland and Wales have welcomed the publication of the report saying that as the possible impacts of the referendum on leaving the EU are considered, the importance of a GB focus on disease control is as important as ever. “The healthier our animals, the more attractive our products. The better our animal welfare, the greater the confidence of consumers in our production systems,” say Nigel Gibbens, Sheila Voas and Christianne Glossop in their joint foreword. They go on to say that addressing AMR helps address other imperatives as an emphasis on sound animal husbandry and healthy animals kept to high welfare standards will help minimise routine reliance on antimicrobials. “Success in controlling endemic disease is one area of considerable importance, and here we can highlight CHAWG’s pivotal role in the development and promotion of national disease control programmes. These include the launch of the BVDFree scheme in England earlier this year, ongoing progress with BVD eradication in Scotland, the development of a Wales BVD scheme, and the Action Johne’s initiative,” explain the Officers. In the report’s conclusion, RSPCA’s head of farm animals Marc Cooper points out that it is clear many positive initiatives are being pursued within the industry. “Notable amongst these are those associated with dairy cow genetics, eliminating BVD, the national dairy cow welfare strategy and the development of a data hub for the collation of information relating to antimicrobial use,” says Dr Cooper. “Indeed, some of these are starting to realise improvements in key areas, for example, dairy cow longevity is beginning to increase, and cow fertility figures and somatic cell counts appear to be moving in the right direction. Chairman of CHAWG Tim Brigstocke says the contributed comments are encouraging and provide positive direction for future CHAWG activities. He also reassures that while this report sees a number of advances in highly topical areas, ‘core’ activities are not being ignored. “Effective farm health planning remains the bedrock of good practice. And while we tend to focus on areas which need improvement, it’s worth mentioning that a delegation from the Food & Veterinary Office (FVO) of the European Commission recently visited and were impressed by the coordinated approach taken in this country,” says Mr Brigstocke.